It’s been a busy six weeks! My last post was about the Texas Writers’ League conference at the end of June. 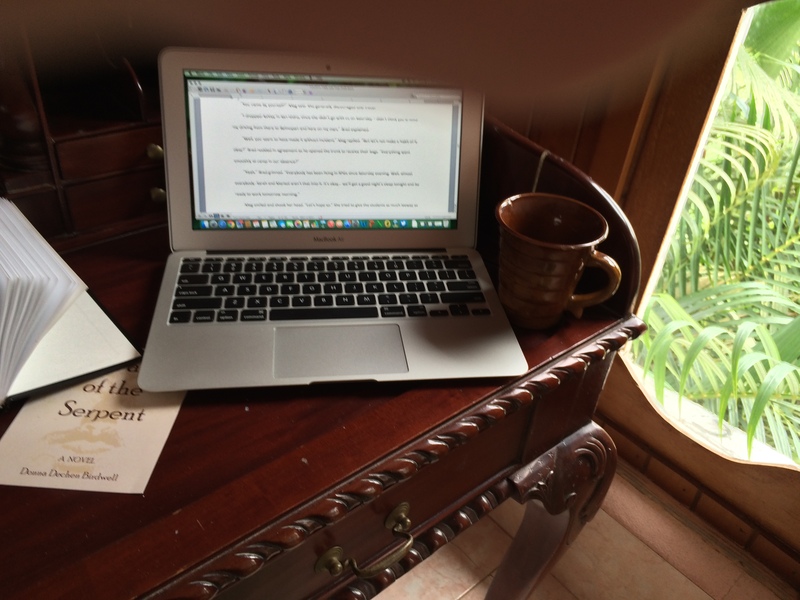 From there I headed off to Belize to revise the first half of my next novel – THE FOURTH TIME – in the environment where the story takes place. Arriving back home, I finished that round of revisions and have now sent the manuscript out to three beta reviewers for critical comment. While I wait to hear from them, I continue writing the first draft of FLIGHT OF THE OWL, which is the sequel to WAY OF THE SERPENT. I am now a bit more than 40,000 words into that one and – so exciting! – I know how it ends. At least, I think I do! WAY OF THE SERPENT is now available at two local independent bookstores – Bookwoman on North Lamar and Malvern Books on West 29th Street. I got my first check from my print-on-demand paperback publisher, CreateSpace, and it looks like my book is doing pretty well on Kindle. I only have three Amazon reviews so far, but all three make me smile. Thursday evening at 7, I’m doing “Novel Night” at Malvern Books, reading from WAY OF THE SERPENT and answering questions from the audience. I’ll be sharing the stage with Steven Metze, author of THE ZOMBIE MONOLOGUES. Final note: Just for fun, I placed a copy of WAY OF THE SERPENT in one of those little roadside lending libraries in my neighborhood. I dedicated it to “my Hyde Park neighbors”, signed it, and asked that it be shared forward. I also circled my email address in the back. It would be so excellent to hear from someone who reads this copy of my book!